We love our Friday afternoon wine tastings, and we are here to report week 2 of our LJ wine tasting pick for under $10. The buyer today was the lovely Ashley who works for Hat Creek Burger Company whom we share office space with. The cheese and grapes came from Dan who is also a part of the Hat Creek crew. 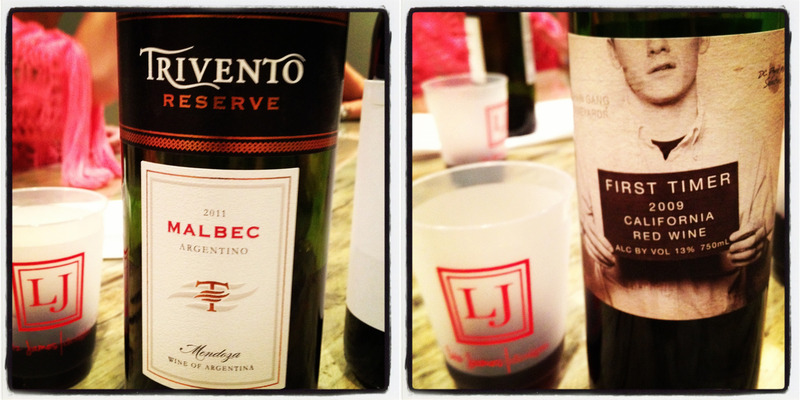 We tasted two different wines, both were red, one from Argentina, and one from California. Our two wines that were unveiled today were Trivento and First Timer. Trivento is a 2011 Malbec from Argentina. It has a dark/inky color with robust flavor. It has a sweet, but not too sweet taste, with a nice velvety finish. Trivento is said to pair best with grilled meats and stews. We all thought it was a smooth everyday wine that you can pair with about anything. First Timer is a California red wine blend from 2009. First Timer is a dark wine rich with tastes of fruit, like black cherry and peppery spices. Oddly I could not find much information online about this wine other than it is from the Chain Gang Vineyards, so I am not sure of great pairings, or professional dialog on the wine. Our tasters found this to be a bit more of a full-bodied wine. Very rich in flavor with a kind of tang, but with a sweet finish. So the votes are in for todays tasting and the winner is…. Trivento! You should be able to find this at your local store ranging in price from $7-$10. 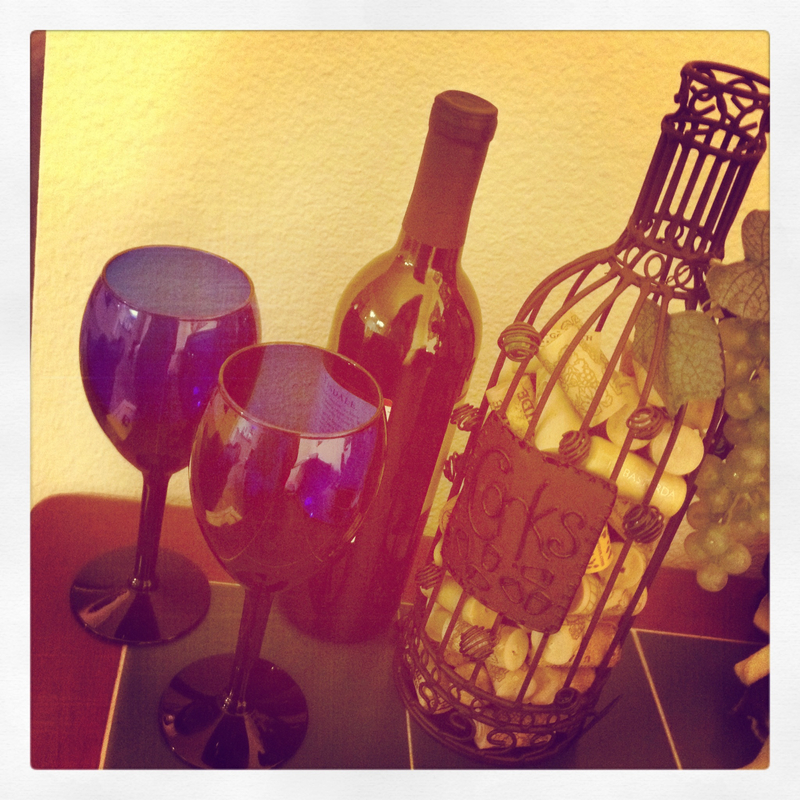 We hope you enjoy your weekend and let us know if you have any special wine picks we should try under $10.00! …Wedding season that is! Spring brings blooming of blossoms and blossoming of love. Spring can sometimes be a mild season with warm weather and sunny days. This recipe can bake up the perfect wedding day, and hey even if it rains that is just good luck on your side. Every year new trends spring forth of creative setups or themes, even different types of wardrobe. One thing that remains constant throughout the years is the idea of a bride in a white dress and or course her glimmering jewels. Classic jewels are traditionally the most sought after for a bride on her wedding day. Pearls, diamonds and other sparkly pieces are most common. On your special day you want to not only feel like the princess that you are, but you want to look it as well. The right jewels will bring your look together and leave you feeling beautiful and confident. Liz James has a wedding collection that likes to touch on the classic all the way up to the modern. Pearls are one thing we know best, and of course even when it comes to your wedding day we say you can wear as many pieces or as few as you see fit. Since the tradition says “something blue,” having a nice subtle hint of blue color on your baubles can accomplish two tasks, fulfilling both the tradition and your need for great jewels. The Dianna chalcedony earrings can do just this with a pale blue shade that can fall down your neckline either with hair back to let them shine, or hair down with just a small speck of color that will peek through. Some of our other small turquoise earrings at LJ would also serve well for this purpose like the Lauren earrings. Other options for your “something blue” could be a simple bracelet like the Zoey bracelet. It gives you a hint of color without completely overwhelming the rest of your look. Truly it can be said that you cannot go wrong with the classic pearl. Pearls are a great choice for either a bride or her brides maids. Pearls are completely timeless and will never go out of style. They are perfect for elegant, formal events and what is more perfect than your wedding day. LJ has many pearls to choose from, but the classic Claudia is one of Liz James original designs. The Claudia sweeps across your neckline with pearls threaded on cord and spaced to give an illusion of floating pearls. 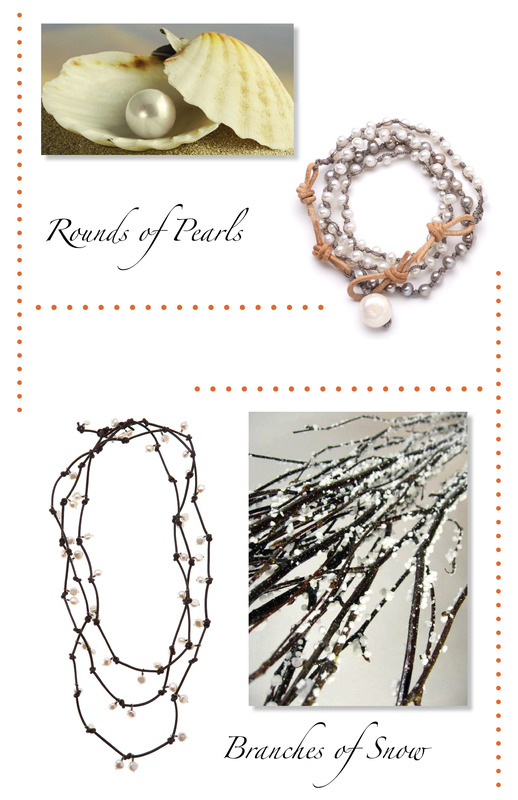 When needing something old, and something new, pearls can be a fabulous choice. It is wonderful if you have an older pair of pearls passed down from a family member for something old or borrowed, but if you are wanting pearls and do not have older ones to wear you can always look for something new! Our bride in the photo has a chunkier necklace look with a small pearl earring. This combination syncs well together, but you can always do the opposite by switching your look up with a daintier necklace and a larger pearl drop earring. Our Norah necklace, for example, always works well short and doubled up to stay high on the neckline. Norah pairs beautifully with the Claudia or Brandy earrings to keep the simple pearl look flowing. Each of them comes in either gray or white pearls if you do not want to keep your whole look so bright, and the Norah can be found in several other colors if you want to play up your look a bit for something more modern. LJ has touched on the blue and on the pearls, so don’t forget about the sparkly! Liz James does carry a few items made from raw diamonds if you are a diamond kind of gal. You will see our diamonds linked together on 18kt gold wire on the Liz necklace that also has a diamond cross that hangs from the front of the piece. If you are wanting something that has that sparkle, but is on the more modest side the Julie diamond necklaces are perfect.The Julie diamond falls from a 14kt gold chain with a small link of diamonds falling across the front. Layering these together can give a great look as well, and hey we all know Diamonds are a girls best friend! So there you have it, some jewel ideas to help you shine and sparkle as you walk down the isle to your future of happiness. And remember if you don’t only want to wear jewels this year at weddings you will see new trends of brides adorning them in their hair, on their bouquet, and even on the wedding cake. 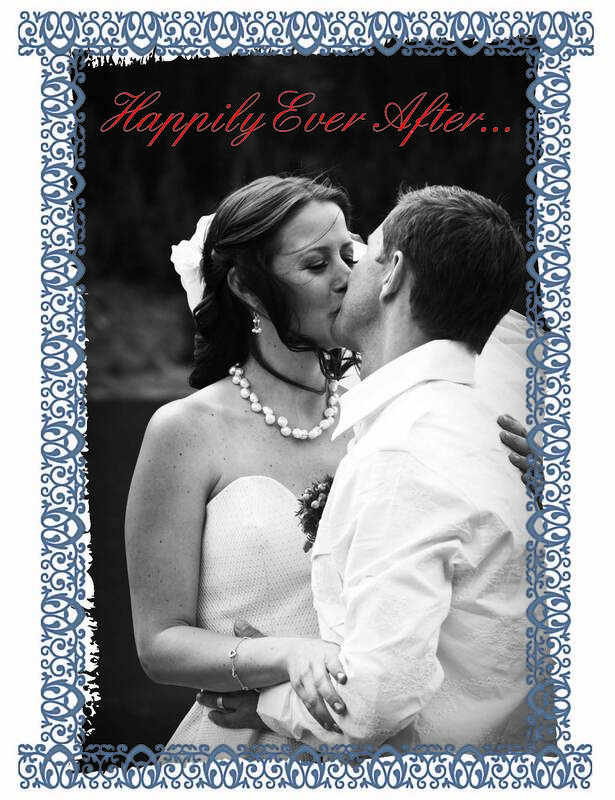 To any of you getting married this season we wish you all the best! What jewelry is your favorite for a wedding? Even if you are only attending one this year what would be your jewel of choice? There are wraps you can eat or there are raps you can speak… but what about wraps you can wear? There are all sorts of accessories you can use as a wrap to pair perfectly with your personal expression. … Or wrap it around your wrist! LJ has all sorts of fun wrap bracelets to choose from. Whether you need an extra pop of color, or just want to dress up a casual outfit you are sure to find that one of these will rhyme well with your style. The beauty of the wrap bracelets that LJ designs is that they are a multi-purpose kind of piece. If your heart so desires you can always wear one of these stunning bracelets around your neck. Most times you can wear the necklace long, or you can double it up for a shorter look. LJ likes to create our jewelry in the most versatile way, to give you the creative reign over how you will sport it. Wrap up these bracelets in bunches for a bold statement look, or wear one wrap at a time to simplify on your accessorizing. Dress them up, or dress them down, you know the drill! And you know your own personal style best. So there you go…. that’s a wrap! What bracelet would suit you best? At the Liz James studio we are all about hard work… but we are also about fun! We love what we do and so it really is hard to consider this work to begin with, but it is good to change the day up a bit to keep things interesting. LJ is starting a new tradition of Friday wine tastings, or “LJ Weekend Wine Pick” since it leads right into our weekend. Every week someone will bring two different wines under $10 to taste. All of the staff will critique them and we will rate which one is best! Now we are no wine experts so more than likely we will not have true form or the correct wine verbiage, but we will have two new wines that we have tasted that we can share with you. Based on the recommendations of what the LJ staff considers to be tasty you may find a great new wine that you too can enjoy! 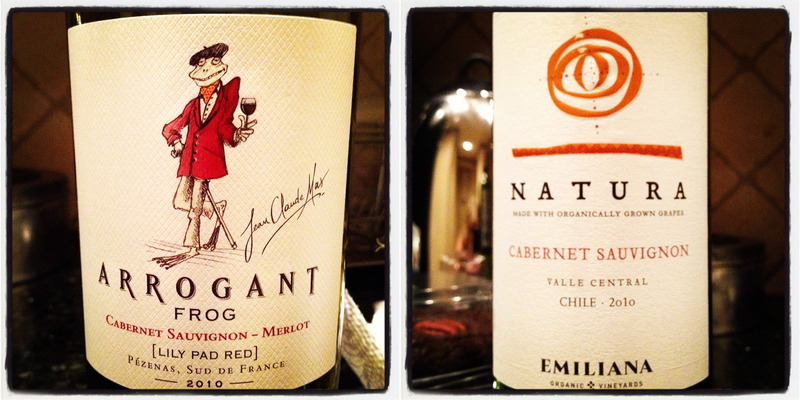 The two wines of the week are Arrogant Frog and Natura. Arrogant Frog is a Cabernet Sauvignon – Merlot Blend out of France. This bottle was from 2010 and is priced at $10.00. This wine with its low acidity has a softening effect. The Merlot grapes give it a soft, fruitiness that makes this wine smooth and approachable. Arrogant Frog is pretty flexible in what it can pair with, but goes really well with Salmon and Tuna. Natura is a Cabernet Sauvignon from Chile. This bottle was also from 2010 and can be purchased at $9.00 a bottle. Bright ruby in color with an aroma of ripe fruit and oak. This wine has a sweet taste, powerful with good body and flavorful persistence. It pairs well with red meats, game, lamb and semi-aged cheeses. So in our first taste test of 6 people the winner is… Natura! If you like a good Cab at a great price then check out Natura for your next wine purchase! Also let us know if you have any great wines that we can compare in our next taste test. Happy Friday! Inspiration can come from many places in life. 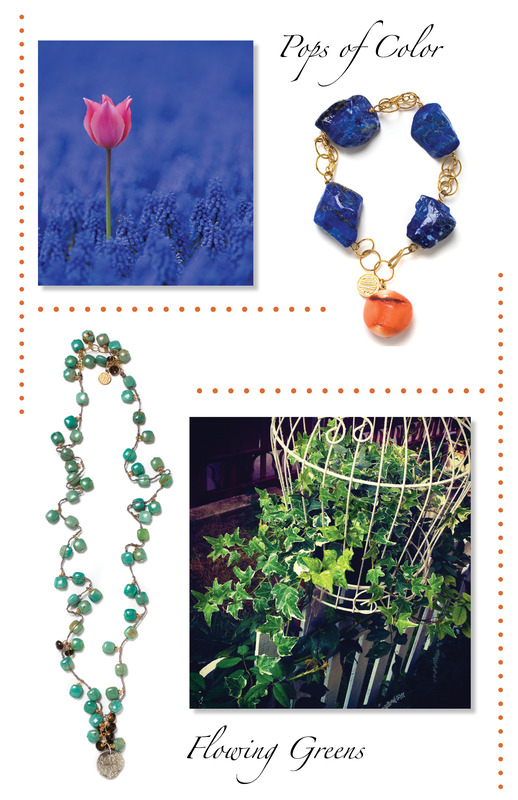 When working with jewels, one of the best places to find inspiration is in the natural world. Nothing can beat the true elegance you find in the environment around you. Seeing the colors we use in their purest form helps to visually piece together the way shapes and colors relate to one another. LJ stands behind the fact that our jewelry truly is wearable art. It is designed to compliment the feminine attributes of any woman just as mother nature compliments our everyday world. Whether its Fall, Winter, Spring, or Summer there is beauty and inspiration in every season. As once said by Ferris Bueller, “Life moves pretty fast. You don’t stop and look around once in a while, you could miss it.” So if you are feeling unmotivated or needing that extra added push in your life just take a good look around you for there is elegance and imagination in everything. Summer 2012 has begun to creep up on us and what would a steamy summer be without some marvelous seaside fashion! Women throughout history are no stranger to being completely fabulous even when stripped down to their bathing suits, so why should this year be any different? From vintage to new age there are tons of hot styles that will be seen all over your local beach, lake, or pool this year. And but of course who would we be here at LJ if we didn’t add some delightful dangles to go with your summer look. When hitting the water this season we are thinking its best to top off any suit with a gorgeous pair of earrings. The best part about your swimwear style you can mix and match how you please. If you feel more comfortable in a one piece than two you can go for a classic vintage look, or go the route of a monokini or tankini mixing and matching your top and bottom as you please. Brightly colored or patterned two pieces are all the rage. You can buy even just a few bikinis, mix and match them, and create multiple looks with mixed hues, polka-dots, stripes or other patterns. The sky is the limit and the more fun you have with it the better! LJ wants you to remember whatever age or size you may be, OWN your look! Be confident and bold in your swimwear fashion and don’t be afraid to take chances. Also keep in mind all of your other favorite accessories like wedges, sunglasses and cover ups to complete your beach fashionista look. What is your swimsuit style? How will you accessorize with your swimwear fashion this summer?